Scientists from the University of California, Berkeley reported a new technique that uses carbon nanotubes to genetically engineer any plant, including gene editing with CRISPR-Cas9, in a simple and speedy method similar to a sewing with a needle and thread. 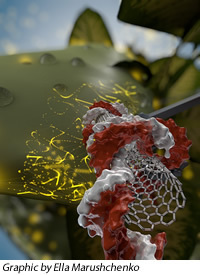 The results are published in Nature Nanotechnology. Physicist Markita Landry grafted the gene of interest onto a carbon nanotube which works like a needle diffusing into plant cells, where the gene is expressed as if it was the cell's own gene. The nanotube is very small (1 nanometer in diameter and several hundred nanometers long), thus it easily slips through the tough cell wall of plants. Genetic engineering methods usually introduce genes through a gene gun or bacteria. Both have the small chance of getting the job done. Nanotubes, however, are highly successful in delivering a gene into the nucleus and chloroplast. Another advantage of the new method is its capability to protect the DNA from being degraded by the cell, and its ability to prevent it from being inserted into the plant's genome. Thus, the technique allows gene modifications or deletions that in the United States and countries other than the European Union would not trigger the designation "genetically modified". One of the key uses of this new method is in gene editing, particularly in the delivery of Cas9, which is responsible for targeting and cutting the DNA, along with the DNA encoding guide RNA to edit particular genes accurately. Read more from the University of California, Berkeley and Nature Nanotechnology.